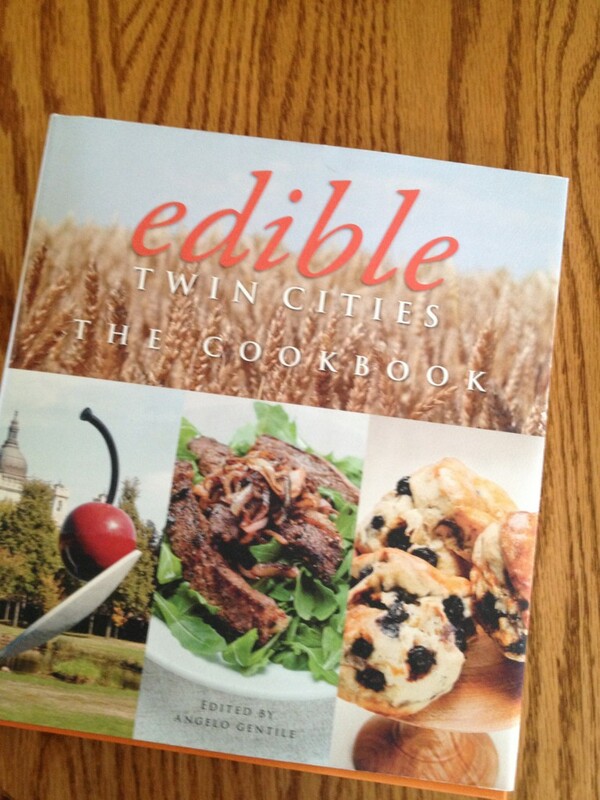 Imagine how I felt when Edible Twin Cities placed her beloved recipe in to their current cookbook. Tears welled out of my eyes when I saw it in print. She would have been so pleased. I have six recipes in this cookbook, and I’m just so honored to be a part of it. The fondest part of these bars were the means to their end; the pan she used was so unique and beautiful- a 15×2 jelly roll pan with a very short side that sported a beveled edge, with two ornate and gorgeous scalloped handles. It was ancient, and now it’s disappeared. I don’t know what happened to it, whether it got thrown out after she died, but there isn’t any amount of time that goes by that I don’t wish with all my might that I’d had the foresight to take that pan in to my own custody. There isn’t much I own of my Mom’s any longer, especially kitchen items like her rolling pin; she’s been gone for nearly 19 years now. But I have no doubt that pan would have outlasted even my life. It was so heavy and so well made. The other part of her kitchen that I always think fondly of was the gigantic round cookie tin she had, covered with deep pink roses. These types of tins were commonplace at the time, and I see them in antique stores everywhere. Whenever she made the Coffee Toffee bars, they always deserved the rose tin. We used that tin all the time, and even as a teenager I recall that one seam on the tin was breaking apart, and there was rust forming on it but she refused to throw it away. “How could I do that?” she lamented to me one day, the time I spent two weeks languishing in her North Woods home one September, sometime in my mid 20’s. We baked, cooked, talked, walked the woods and sat in companionable silence, just enjoying each other and our shared life. The rose tin was a mess, and she hardly used it anymore, she told me. But she couldn’t get rid of it. So many ‘What ifs’ and ‘Had I known’ moments pass through me when I think of those perfect weeks together, of beloved cookie tins and treasured recipes. A few short years later she was gone, and so were my chances of ever having those moments with her, moments that I fervently wish I had done so much more often. These Cacao Toffee shortbread cookies are light years away from the rich and dense ones that Mom made, delicious in a modern and albeit better way. Every time I pull out my stash of flour alternatives, which grows exponentially with each passing week, I wonder what she would think of the switch in our baking mindset to healthier options. Would she still make her beloved bars and cookies, learning to use different flours, healthier sweeteners, coconut oil? Would she embrace using whole grains? Or would she simply sneer at the change and reach for the white flour and sugar? I like to think she’d evolve as the world around her did, that we would share our finds together and I’d help her understand this new way of thinking, of baking for the better. That we’d talk about how delicious it all can be, or I’d send her boxes of goods- like garbanzo flour, cacao nibs, rice flour and chia seeds- that she might not be able to find living within a stone’s throw of the Canadian border, that we’d Skype to discuss a recipe, or just to connect again in our shared lives, maybe saying nothing, sharing the occasional familial smile. 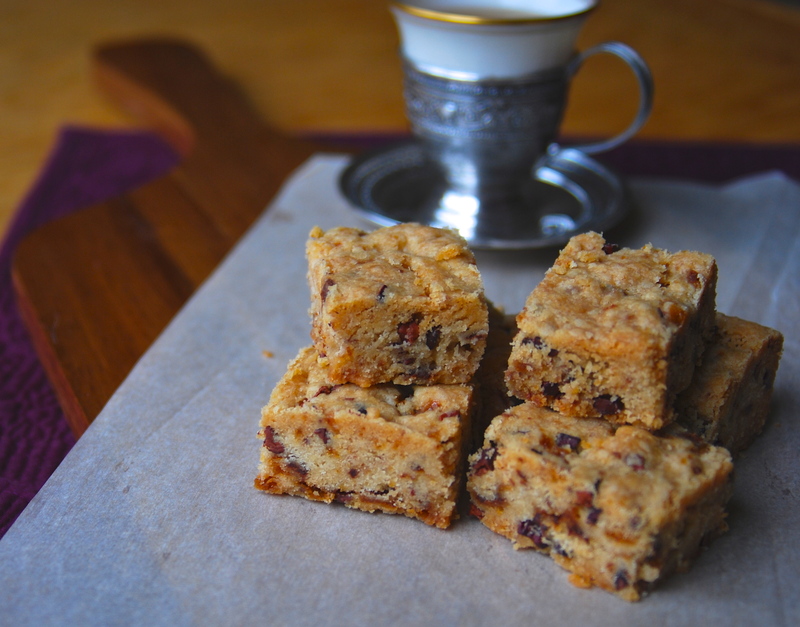 Rice flour makes this shortbread superbly tender and flaky, and in taking a dare, I subbed the cacao nibs for chocolate chips. And while I realize they add very little chocolate flavor, what they do add is their addictive snappy, popping crunch that compliments the flaky crumb beautifully, without making them overly sweet. 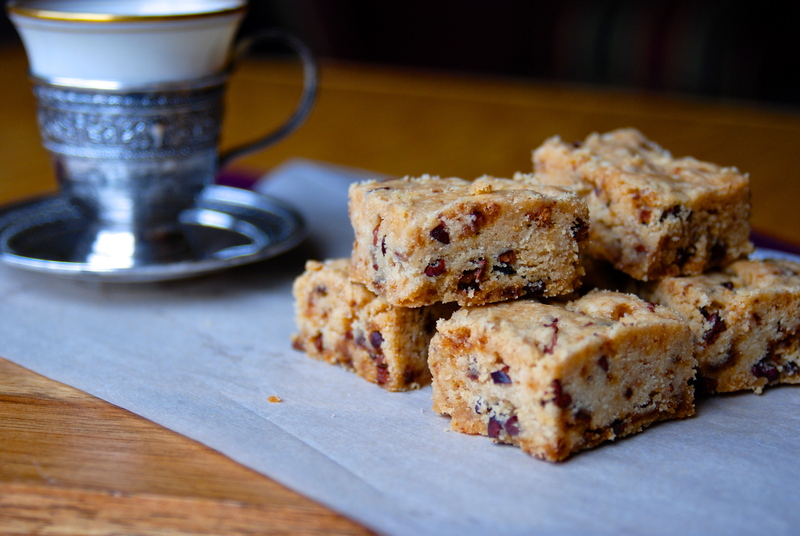 For nostalgia, I’d whip up a batch of Mom’s bars, wishing for that jelly roll pan and a table to set them on between us as we enjoy them, and each other. But I can’t. So I take the modern route, reach past the chocolate chips to the here and now and make them different. For me, for the time we’re in, the healthier path we choose, and raise a silent toast to her, thinking that she probably would love these ones just as much. Heat oven to 325°. (Using a glass pan? Reduce temperature to 300°) Spray a 9×13 baking pan with cooking spray and place parchment on the bottom, hanging slightly over the sides. Whisk together the AP flour, rice flour and salt. In the bowl of a mixer, whip the butter until light and fluffy, about 2-3 minutes. Add in both sugars and whip again until creamy and smooth, about 3-5 minutes. Make sure the sugar is fully incorporated; you shouldn’t see granules in the butter. Working with about a 1/2 cup of flour at a time, gently fold it with a heavy wooden spoon in to the butter until the last 1/2 cup remains. Add that, the cacao nibs and toffee and gently fold it all in, making sure you scrape to the bottom of the bowl. Dump everything in to the pan and gently spread it out with your hands, smoothing the top. Prick all over with a fork and bake for 45-55 minutes. Less time will yield a crumbly bar; more time will make them denser and more firm. Allow to cool for 10-15 minutes, then slice in to desired shape. Cool completely in pan, then lift parchment and place cooled bars on a cutting board. Cut fully through and store in an airtight container. Beautiful Kate! I just discovered cacao nibs a few months ago and I really like the coffeeish flavor and crunch they add to baked goods. I made some banana muffins studded with them and loved the results! Kate, this was really beautiful. A touching tribute and a very special recipe, indeed.